Obstructive sleep apnea (OSA) is a major heath problem. In the United States, at least 17 million people have moderate to severe OSA, which is characterized by heavy snoring, airway blockage and frequent awakenings during sleep. An original design for an oral appliance developed in Hiroshima University Hospital can help sufferers of sleep apnea sleep more soundly. A new study appearing in the journal CHEST, published by Elsevier, may change the way we think about sleep disorders. Itamar Medical Ltd., a company that develops, manufactures and markets non-invasive diagnostic medical devices for sleep apnea with a focus on the cardiology market, today announced the launch of WatchPAT 300, the next generation WatchPAT system for home sleep apnea testing. People who stop breathing during sleep may have higher accumulations of the toxic protein tau, a biological hallmark of Alzheimer's disease, in part of the brain that manages memory, navigation and perception of time. A new study has revealed that people with obstructive sleep apnoea or those who snore at night are more at risk of dementias and Alzheimer’s disease. People with sleep apnea may be more likely to have higher accumulations of an Alzheimer’s disease biomarker called tau, according to a study presented at the American Academy of Neurology. 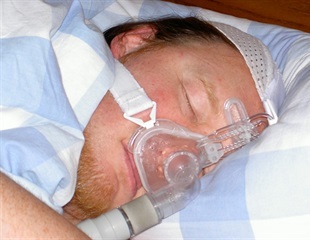 Adults with obstructive sleep apnea (OSA) who experience excessive sleepiness while awake appear to be at far greater risk for cardiovascular diseases than those without excessive daytime sleepiness, according to new research published online in the American Thoracic Society's American Journal of Respiratory and Critical Care Medicine. Children are grossly underdiagnosed for sleep disordered breathing, which includes obstructive sleep apnea (OSA), and the symptoms may be wrongly attributed to behavior issues, according to research in the Journal of the American Osteopathic Association. Voyagers no longer embark in search of the storied Fountain of Youth, but the quest for longevity is still very much alive for researchers. The ill effects of air pollution may literally be causing some people to lose sleep, according to new research published online in the Annals of the American Thoracic Society. ​A new study has found that a common but dangerous sleep disorder called obstructive sleep apnea (OSA) poses more of a cardiac risk to women than men. How can a doctor predict the treatment outcome of an individual patient? Traditionally, the effectiveness of medical treatments is studied by randomized trials where patients are randomly divided into two groups: one of the groups is given treatment, and the other a placebo.